Welcome to British Tomato Week. I love tomatoes so it’s great to have an excuse to celebrate them! This week I’m going to share a range of recipes I’ve come up with using this delicious ingredient. I’d love to hear about your favourite tomato recipes, too, so please do get in touch. Tomatoes originate from the Andes in South America where they grow wild in what is now Peru, Bolivia, Chile and Ecuador. They were first cultivated by the Aztecs and Incas in around 700AD. 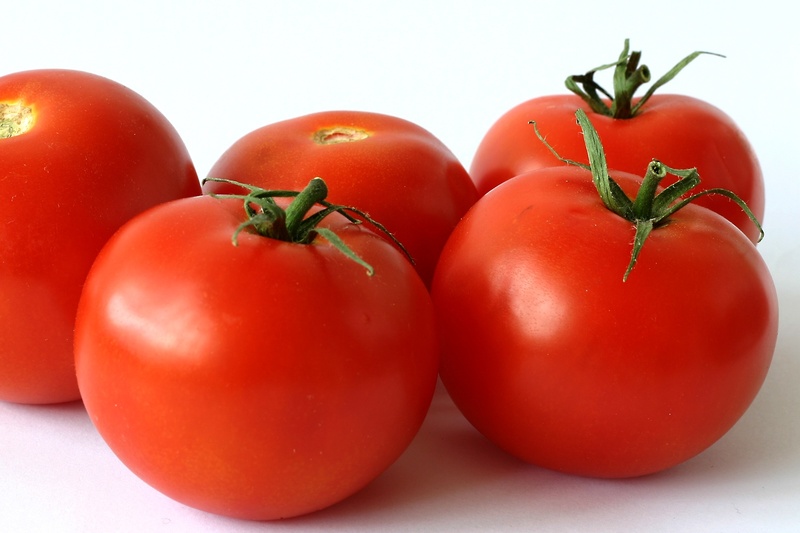 Tomatoes are full of vitamins (A, C and E), potassium, carotenoids and flavonoids. These vitamins and antioxidants are thought to combat the harmful effects of the free radicals that cause cell damage and help protect against heart disease and some forms of cancer. 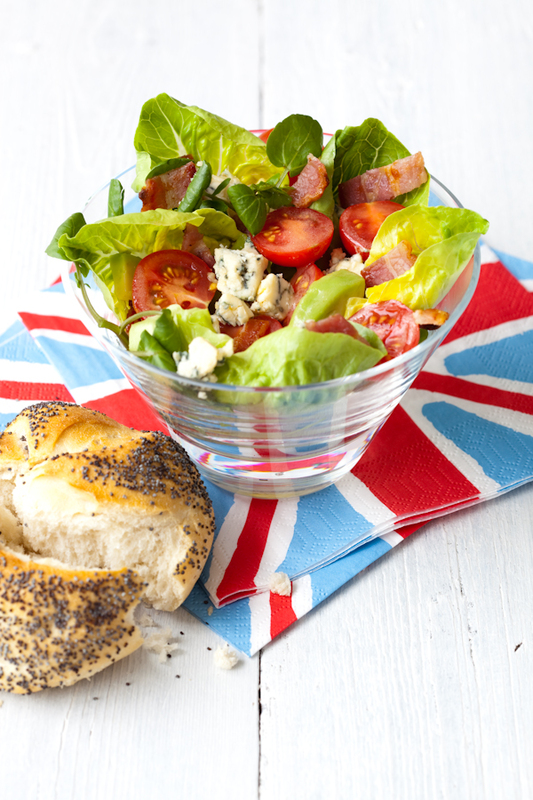 This beautifully patriotic-looking salad seems like the perfect way to kick off British Tomato Week. Grill the bacon until crisp, then chop into small pieces. Separate and rinse the lettuce leaves, halve the cherry tomatoes, trim and rinse the watercress. Mix the lettuce leaves, tomato and watercress together. Peel and slice the avocados and coat with lemon juice to prevent browning. Combine the avocado slices and blue cheese with the salad. Whisk together the wine vinegar, honey and mustard. Add the olive oil steadily in a fine stream, whisking as you pour. Season the dressing to taste. Divide the salad between four plates or bowls and drizzle with the dressing. Scatter the crispy bacon over the top. Top tip: If you don’t want your avocados to go brown, simply leave its pip in the salad until serving (don’t forget to remove it then!). Beef tomatoes are perfect for stuffing, experiment with different combos to find your favourite. Stand the tomatoes on their stem ends and slice off the top quarter. Remove and reserve the tomato pulp. Turn the tomatoes upside down to drain. Melt the butter in a pan and fry the onion, garlic and celery until soft but not browned. Stir in the breadcrumbs, herbs and tomato pulp. Season well. Fill the tomato cases with the mixture and replace the tops. 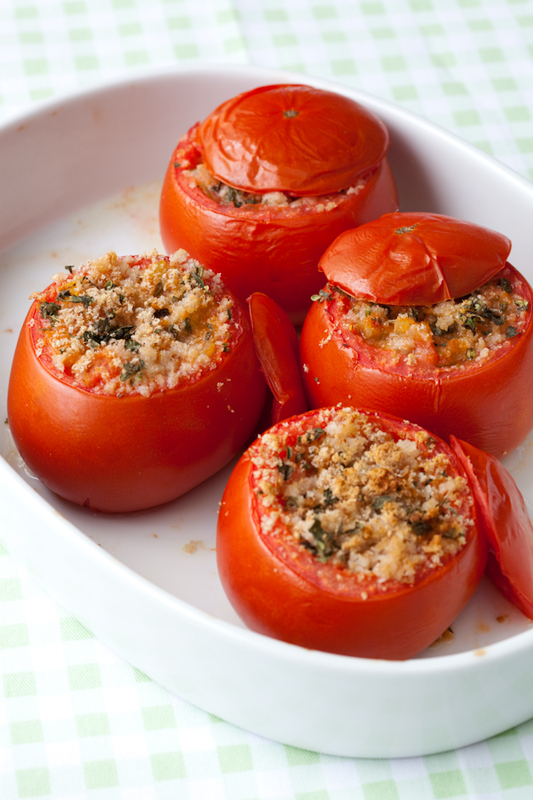 Place the tomatoes in an ovenproof dish and bake in the oven for about 20 mins. Serve hot. Top tip: To give the filling a crisp and golden top, remove the tomato lids and place them in the base of the dish halfway through the cooking time. To find out more about British tomatoes, visit www.britishtomatoes.co.uk. And watch this space for more tasty recipes all week.